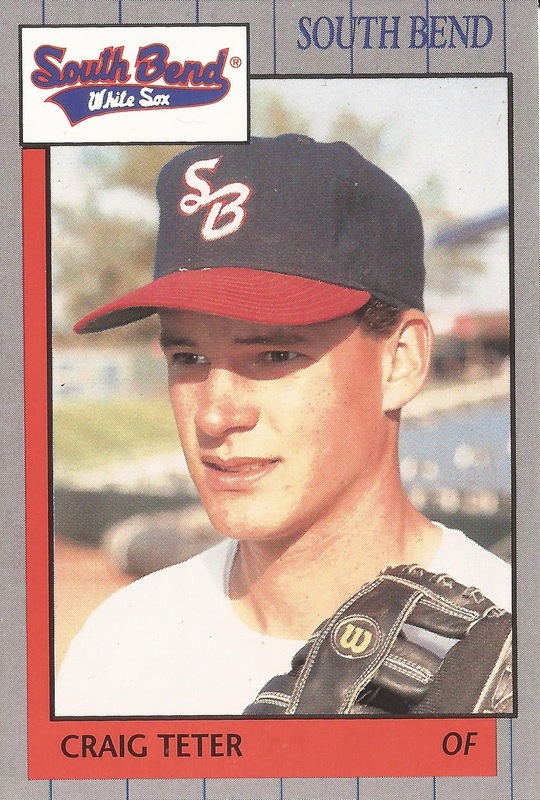 Craig Teter went on a bit of a tear for the Gulf Coast League White Sox in July 1989, according to his Best card. Teter rattled off a 14-game hitting streak and a .397 average that month, on his way to a .284 season average over 43 games. Teter moved up to single-A South Bend the next year, but he couldn't keep it up. His 1990 campaign also turned out to be his last as a pro. Teter's career began in 1988, taken by the White Sox in the 33rd round of the draft out of Seminole Community College in Oklahoma. Teter hit .337 at Seminole before joining the White Sox GCL club later in the year. He got into four games with the GCL White Sox, going 4 for 14. Teter then returned to the GCL for 1989, the outfielder hitting three home runs and knocking in 21. He then moved to South Bend for 1990, also seeing short-season Utica. At South Bend, he got into 27 games and hit .262. At Utica, he got into another 35 games, but hit just .138. Teter's Utica card listed his favorite major leaguer as Dale Murphy and his past times as hunting and golf. Teter couldn't follow Murphy to the majors, though, his career ending short of AA.